After yesterday’s adventures, it was time to take it easier again today and I started out with the others. 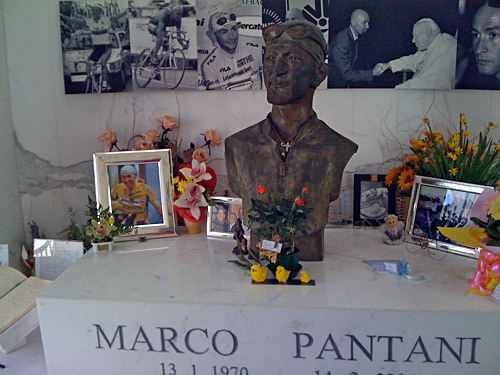 The plan was to go to Cesenatico and visit Pantani’s grave and generally take it easy today. After we got going we were soon in Cesenatico and I had some photos. We hoped to visit a bicycle shop, but it was not open. Some went into the Pantani museum and then we fooled around for some time trying to find a café, which we eventually found. People were divided on what they wanted to do for the rest of the day and I thought I could go and do some smaller passes that I was supposed to have done on my first day, before changing plans. So I took the direct road to Cesena and managed to find my way through the somewhat big city. Outside I stopped at a small grocery (in S. Vittore) and had a little lunch. It was quite hot today around lunch time in the sun, but it got a bit chilly later on. I then found a quite narrow steep road going up to Collinello (305m) and it felt nice getting up a bit and getting instant nice views of the area. I found the road to Meldola, where I think I stopped again for a coffee (no hurry today) mostly in order to get some coins to be able to buy a new inner tube from an Schwalbe machine outside a bicycle shop (see photo of such a one from the Ötztaler radmarathon last fall). 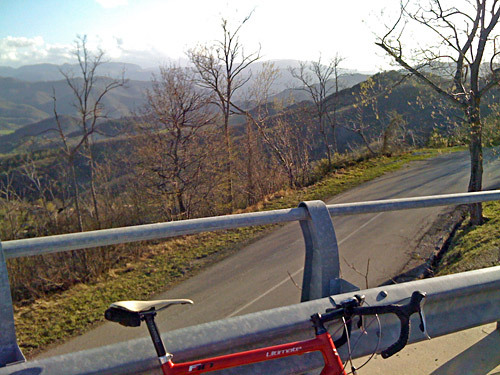 This time I continued up Valle del Bidente to Civitella di Romagna (219m). Even though the stretch up there is seemingly quite easy and the weather was fine, I had a quite strong headwind to deal with and it made me really tired when I finally arrived in the village and decided to stop again (not knowing where the next stop would be, if at all). I had a coffee and ice cream at a good café. Coming outside I noticed it was a bit more chilly, but I was not going real high today, so it would never get very cold. 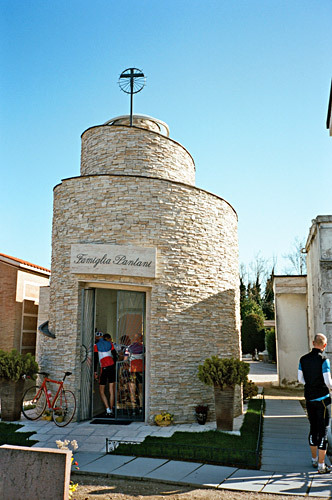 Here starts one of the toughest climbs in the whole Rimini area. 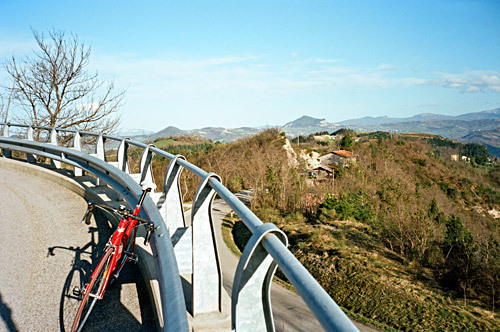 The road up to Passo Sulparo and Valico/Monte della Faggia (771m) has ramps that occasionally reaches above 20%. 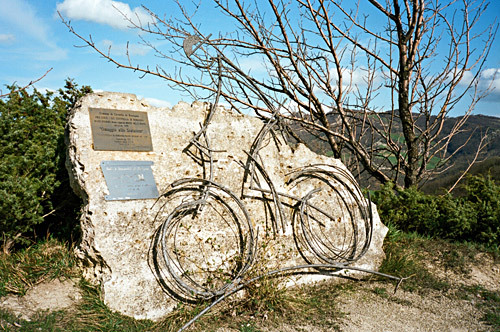 Once up at the first pass, where there is a monument dedicated to “cycloclimbers” (see photo below), the road very irregularly continues to climb to the highest point (785m). I actually saw traces of snow on the first part of the descent on the side of the road despite the low altitude and here it was chilly, but then came a steep and nice descent on a very twisty road down to Civorio. 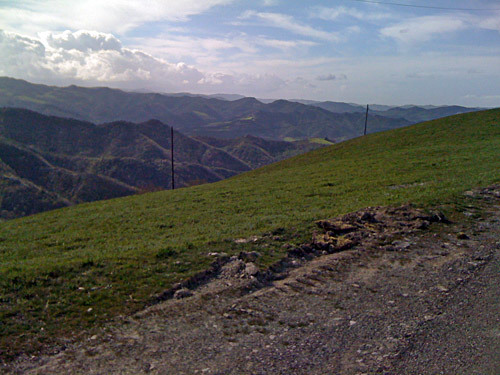 The road down the Valle del Borello to Ranchio (303m) was narrow and nice. From Ranchio, the next climb started at once up to Passo della Musella/(Valico di) Monte Finocchio (612m). This road is wide and good. It is much nicer on the south side of this pass, where I stopped for a few photos. 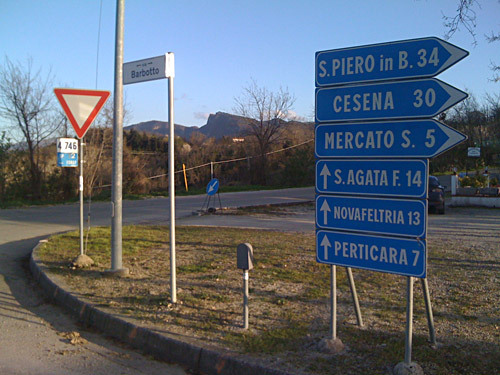 Now it was time for me to get into exploring things and I decided to take off the road and go down the more (on the map) direct road via Tezzo and Monte Castello to Mercato Saraceno in Valle del Savio. The road is marked as asphalted on the TCI map, but there were reasons to believe this was not quite true and I had not find any conclusive evidence for or against it on the web beforehand (satellite images are hard to decipher when it comes to road surface and those photos may be old). It turned out that the main part of the descent was unsurfaced but rideable slowly and with nice serpentines. I met a mountain bike cyclist here. 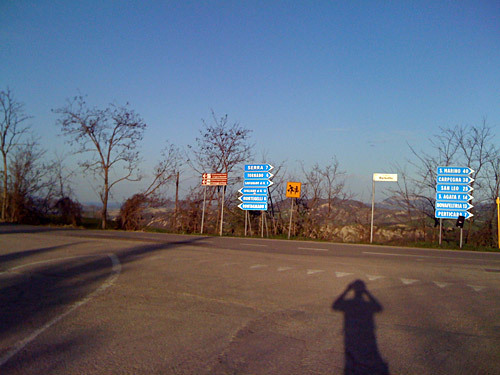 The start of the next climb was also easy to find (see photo for start and finish of the Barbotto climb). The Passo del Barbotto (515m) from Mercato Saraceno (134m) is a classic climb and has many times figured in Giro d’Italia (at least it was in the 2010 race for certain) and is a classic through the famous amateur race Nove Colli. It starts out like any other pass, but becomes harder and harder toward the end. I wanted to get up to Perticara, but I noticed it was already getting dark and also quite cold. I had hoped to get to Perticara before shops close at 19:00, but I was going to miss that time and decided to forget about Perticara. 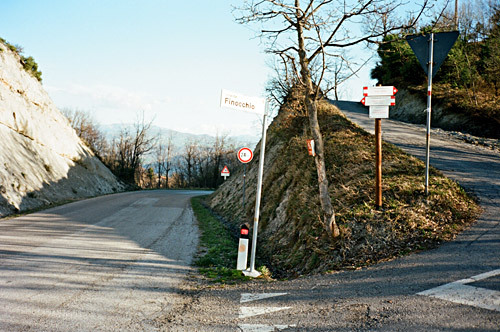 I improvised the way back and went down the road between Barbotto and Perticara to Montetiffi (from a height of 618m). A quite nice road, with some damages, and also a little climb before getting down to the Valle dell’Uso at Ponte dell’Uso (164m). From here on it was a fast and easy road down to Sant'Arcangelo, where I put on lights (I think) before the last kilometres back to Viserba/Viserbella (we were staying just at the border between these localities of Rimini (north)). I had lots of time for getting out to eat. I think today was the day I had two pizzas, but the second one was really no good. It had been a nice and somewhat relaxing day. 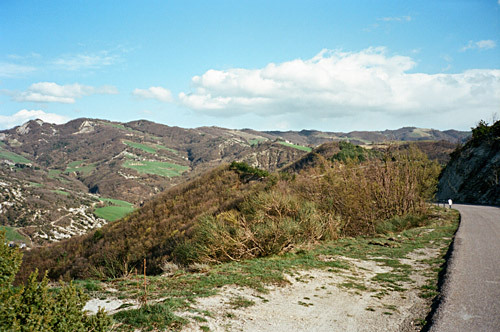 The next day was again going to be somewhat easy as I had already in advance planned to go with the others up Rimini’s nearest mountain over 1000 metres – Monte Carpegna (1357m).